We are a leading Wholesale Trader of heat press machine from Pune, India. Attributing to the expertise in the domain, we are capable of manufacturing an utmost quality Heat Press Machine. Known for its low power consumption and longer functional life, our offered range of heat press machines offered by us is widely demanded in the market. Moreover, this offered machine is highly regarded for its sturdy construction and perfect finish. 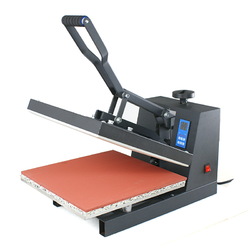 Looking for Heat Press Machine ?